Before we can understand today’s modern bullet cartridge, it’s helpful to understand what came before it. How firearms have evolved over the centuries has directly impacted the evolution of ammunition as well. Changes to projectiles evolved slowly over the centuries, and the firing process pretty much changed just as slowly. From the very beginning, firearms needed three separate components to function: the projectile, the powder and the charge. This changed very little for hundreds of years. The first advancements to the method of firing a gun was an effort to find a way to integrate the charge into the weapon itself. To accomplish this, early muskets included a small bowl-shaped metal plate at the breach of the weapon called a “flashpan”. The flashpan had a small hole connecting it to the breach where the firing powder was contained. A small amount of powder would be placed into the flash pan and, when lit, would ignite the rest of the powder in the breach propelling the projectile out of the gun. In an effort to improve accuracy and to speed up the firing process, the act of igniting the powder in the flash pan was made simpler with the invention of the “matchlock”. The matchlock contained the first “mechanism” to expedite the firing process of hand-held firearms. With the matchlock, no longer did the shooter have to lower a lit match into the flashpan to ignite the powder – the mechanism did it automatically. This advancement freed up both hands to steady the weapon and, more importantly allowed the shooter to keep both eyes on the target. Introduced in the early 15th century, the matchlock consisted of a curved metal clamp alongside the gun known as a “serpantine”. The serpantine would hold a slow-burning match and, when a lever would be pulled, the serpantine would lower the match into the flashpan igniting the powder. 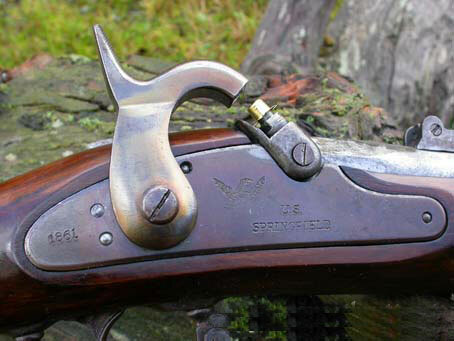 As the design evolved, the serpantine would be fitted with a spring and pulled back and a trigger was used to release the spring sending the match forward into the flashpan. It would take nearly another 200 years before the matchlock would be improved upon. The very first true flintlock firearm was developed by Frenchman Marin le Bourgeoys who designed it for King Louis VIII. Flintlock muskets, pistols and rifles were the mainstay of every European and American army from 1660 to 1840. 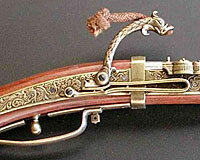 The flintlock improved upon the matchlock in several ways. First of all, an open flame was no longer needed as it was replaced with a simple spark. The spark came courtesy of the serpantine being fitted with a piece of flint. The flashpan was replaced with a smaller “priming pan” that held a lesser amount of fine black powder. The priming pan, like the flashpan, contained an opening into the breach which contained the rest of the powder. A small piece of steel (called a “frizzen”) was mounted to the top of the priming pan and, when the trigger was pulled, the flint would strike the steel creating a spark igniting the powder in the breach. 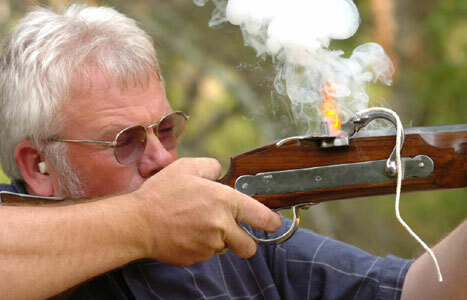 Again, about 200 years would pass before a leap in technology would improve the firing method for any type of gun. The next step in the evolution of the firing method was the “percussion cap”. 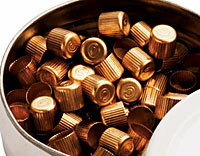 The percussion cap was developed around 1830 following the discovery of “fulminates” – chemical compounds that are friction sensitive explosives. Being “friction sensitive”, fulminates such as mercury and potassium will explode on impact. Thus, the flint and steel of the flintlock design was replaced by a chemical compound that would explode on contact proving to be much more reliable than the flint and steel method. Percussion caps only saw widespread use for about 50 years. 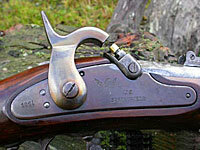 It was adopted by most armies around the globe as it was far more reliable, especially in wet weather, than the previously used flintlock design. 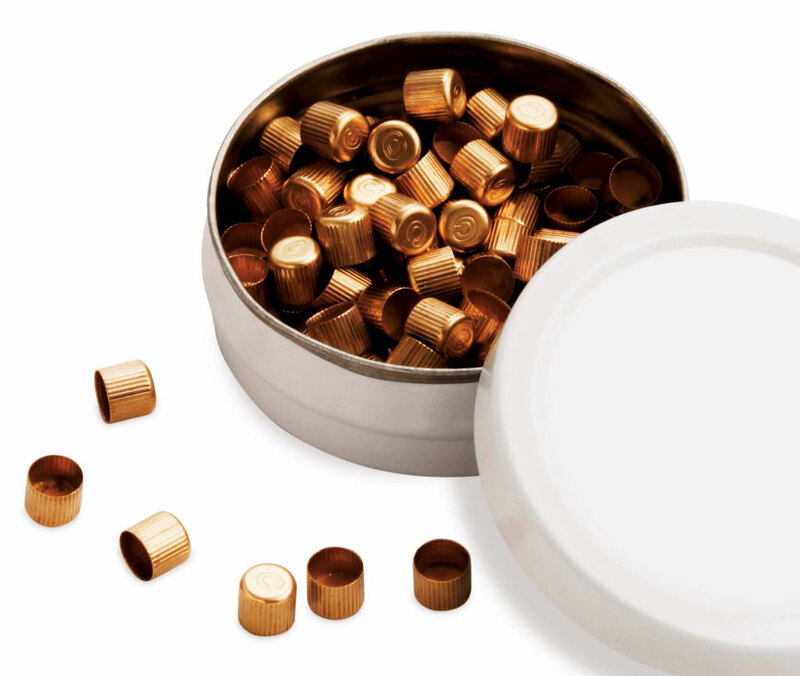 While it was only used for a brief time, the percussion cap was the catalyst to the greatest achievement in ammunition technology: the “self contained cartridge”. I know right knowledge is fun! I look forward to reading more about guns.